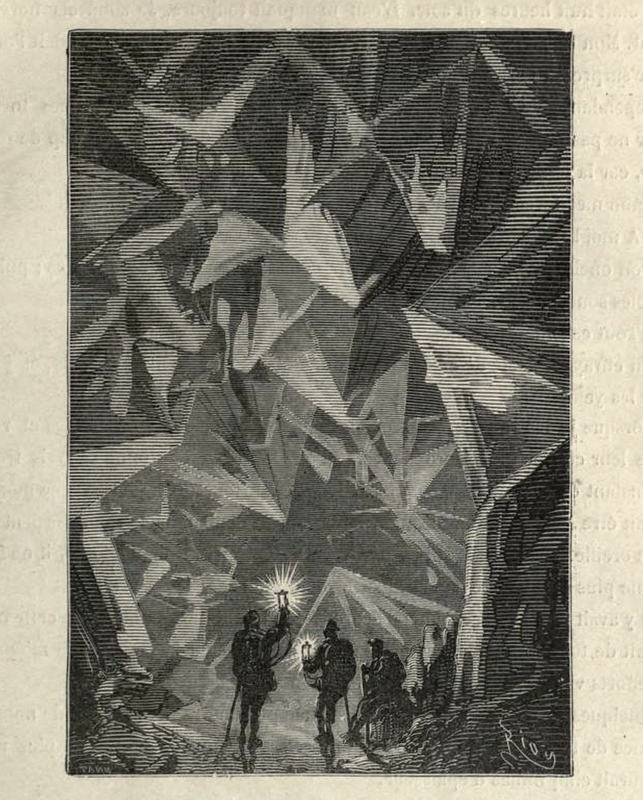 Jules Verne, Voyage au Centre de la Terre: Imaginary visit inside a diamond. Examples of seismic rays propagating through Earth’s layers. 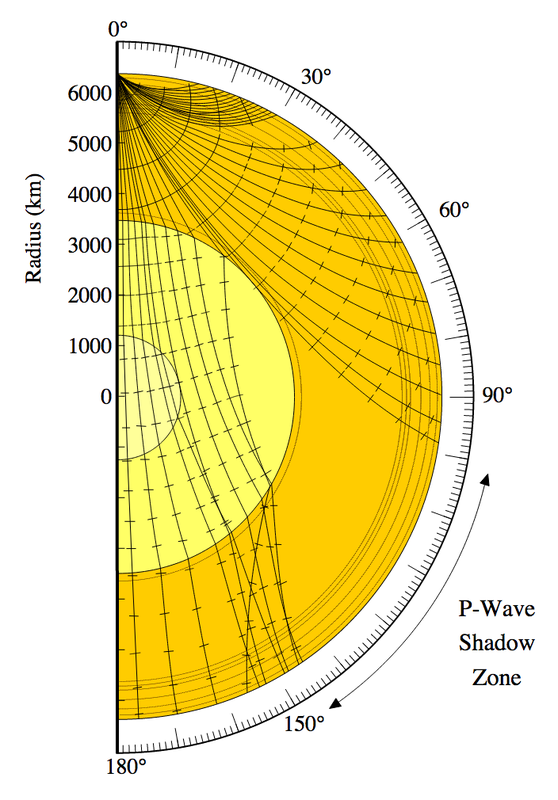 The P-wave shadow zone lies between about 103 and 143 degrees from the epicenter. One major piece of evidence in support of this model was the behavior of seismic waves generated in an earthquake, which can be felt and recorded at locations all over the globe. Earthquakes trigger many different types of waves that propagate either through the body of the Earth or along its surface. Of the former type, P-waves (primary) always arrive first and are longitudinal, like sound waves in air, while S-waves (secondary, or shear) arrive second and are transverse, more like a wave on a string or a ripple on a pond. How fast each of these waves can travel is controlled by the material properties of the medium, and when a wave encounters an interface between layers with different material properties, it will bend, just as a beam of light bends when it crosses from air to water. When a P-wave hits the core-mantle boundary (CMB), its seismic velocity drops abruptly, and it’s refracted, and its trajectory is bent. When it reaches the other side of the core, it is refracted again (the opposite way), and as a result of these gymnastics, that particular wave is recorded somewhere at the surface far away from the location it would have reached had it taken a direct path. The angle of refraction depends on the angle of incidence and the ratio of velocities going from the mantle to the outer core (just like Snell’s Law in optics), and it results in a shadow zone where P-waves just aren’t observed within a certain range of distances from the earthquake epicenter. 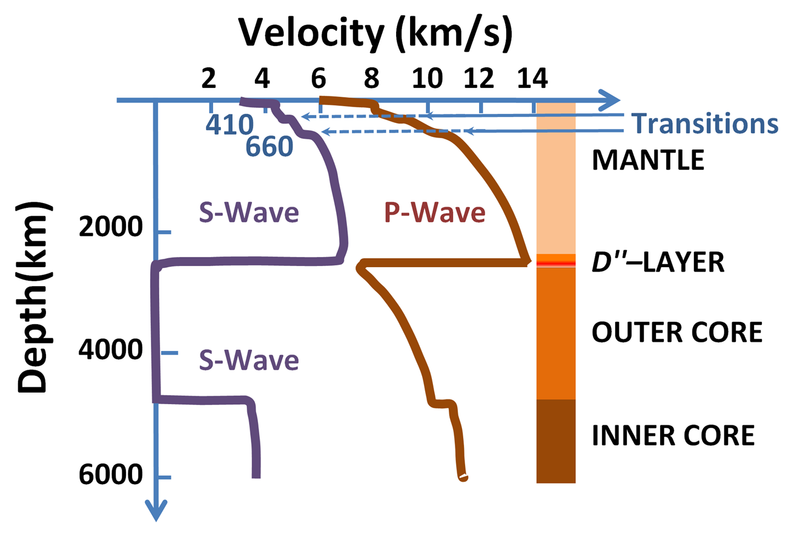 Average P-wave (orange) and S-wave (purple) velocities through the different layers of the Earth. To see why that happens, consider two almost identical ray paths, one of which almost hits but misses the CMB and the other of which hits the core and is refracted. The first ray will only pass through the mantle, so its trajectory is pretty direct,2 but the second ray is bent away from its initial direct path. No P-waves can arrive between about 103° and 143° of the epicenter, leaving a donut-shaped region of absent arrivals – a shadow of the core. Things get even more extreme when you consider S-waves, which can’t pass through liquid at all. That’s because static liquids can’t support shear stress (which is why they conform to the shape of whatever container they’re in), so shear waves just can’t get through and aren’t seen beyond about 103° from the earthquake epicenter. So that’s where it stands: no P-waves from 103°-143° and no S-waves at all beyond 103°. Except…there are waves that arrive in that shadow zone, so where do they come from? Actually, those shadow boundaries are a bit fuzzy because some waves skirt around the CMB through a process called seismic diffraction, but even that can’t explain all of the supposedly forbidden arrivals in the shadow zone. For that, there needs to be an inner core. 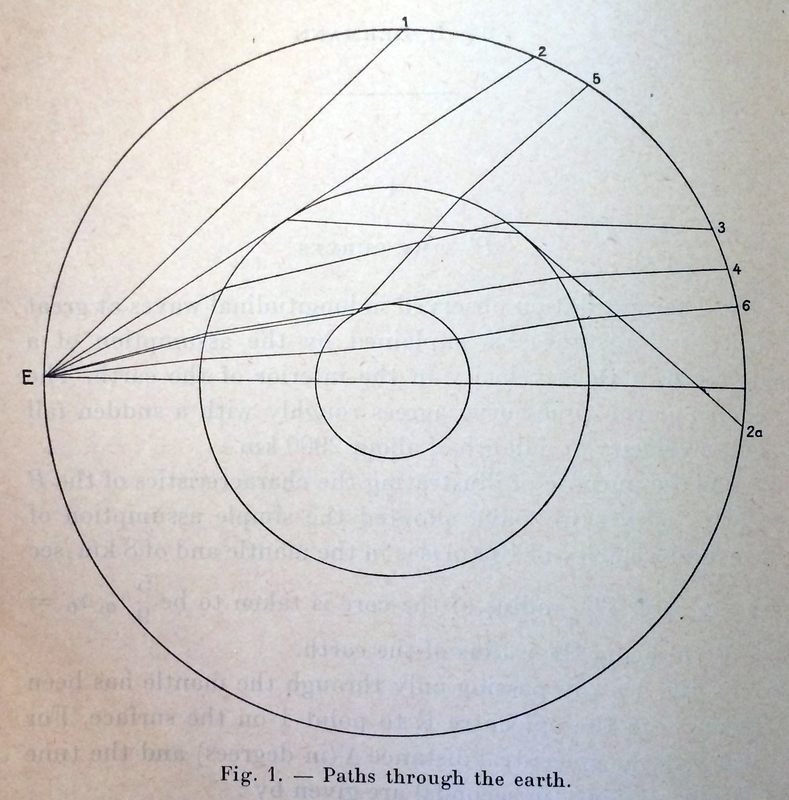 Ray paths through the Earth with an inner core. 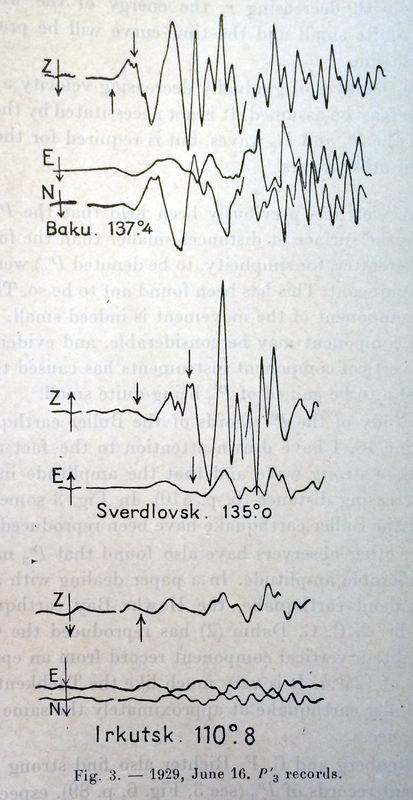 Waveforms, 1929 New Zealand earthquake. 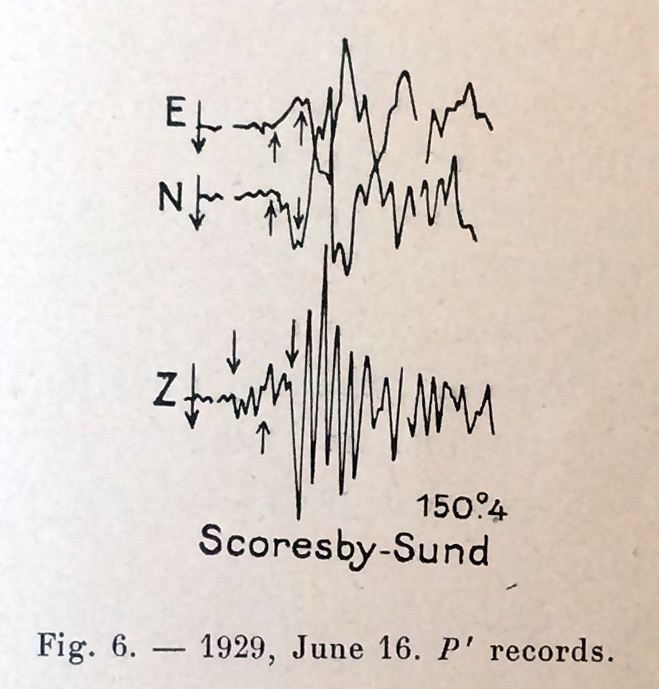 Within a couple of years, this explanation was widely accepted by the seismology community, although the fact that the inner core is solid, first proposed by Francis Birch in 1940 and extended by Keith E. Bullen in 1946, could not be decisively determined for several decades. Bigger earthquakes naturally produce seismic waves that sample greater depths, and to “see” the inner core, seismologists needed a really big one…or better yet, several. In the 1970s, analysis of recent large earthquakes that had excited the lowest, fundamental frequencies of the whole Earth provided support for a solid core. Our understanding of the internal structure of our home planet is improving all the time, as seismic networks expand, international collaborations pool data, and computational power advances. Huge earthquakes can be–and frequently have been–devastating in terms of human lives lost, but these deadly events also offer hints as to what lies beneath our feet and how it got to be that way. Some say that space is the final frontier, while others reply that the oceans remain largely unexplored. Earth’s interior offers another tantalizing frontier, and while a Vernian journey to the core is unlikely (to put it mildly), geophysics gets us a pretty good view, even from all the way up here.